The most effective and underutilized serve in doubles is the serve to the body. Serving to the body is optimal because returners have more trouble directing this serve where they wants it to go (i.e. away from the net player). If a serve is hit to the body, the player must quickly move out of the way and get in position to hit a decent return. 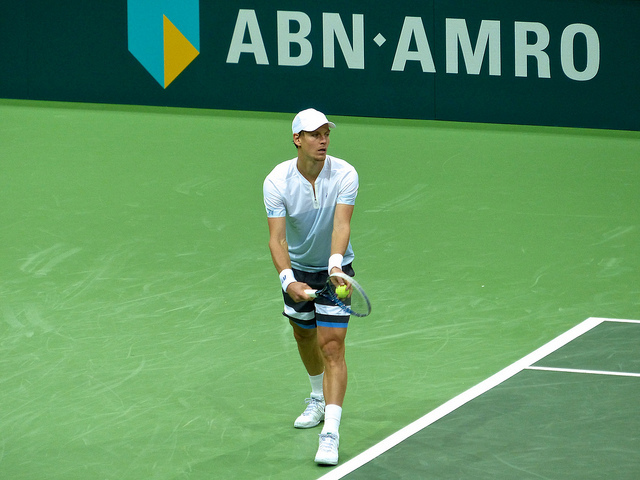 Most players have poor footwork when faced with a body serve, or get flustered when the ball is coming straight at their body. This is exactly what you want when serving against a returner. A serve to the body takes away the ability of a player to move forward while hitting the ball. And the body serve reduces the angles that returners can hit into. By contrast, serving wide gives the returner a great crosscourt angle, and should only be utilized if the server can accurately place his or her slice serve and produce a wide angle. Serving down the T is also a great serve for cutting down angles and forcing a more difficult inside-out return to avoid hitting near the net player. However, I think the body serve is even better. The body serve is the most likely to produce an errant or misplaced return because it is extremely difficult to move out of the way and hit a well-placed shot. And the body serve is also the easiest and safest serve to hit. This is because you are aiming for the middle of the service box. As a result, you have less of a chance of hitting the ball wide. Throw in some nasty spin with the body serve and you are going to get a lot of weak returns. 1. They want to serve the ball away from the returner. 2. They want to ace the returner. 3. They want to serve to the returner’s weaker side. 4. They subconsciously feel that aiming to the body is disrespectful or fosters ill will. The four reasons above are legitimate. However they fail to acknowledge the superiority of the body serve. Getting into position to hit a return when the ball is coming toward your body is extremely difficult. As a result, the net player on the server’s side has a much greater chance at hitting a volley off the return for a winner or to set up an advantage in the point. The body serve is not only a great doubles serve; it can work really well in a singles match too, for many of the same reasons (no net man to put away the return). I hope you use this tip the next time you play doubles. Hit more serves to the body and you and your partner will feast on easy volleys at the net. What serve do you think is the best for doubles? Comment below!